Along with every area covered in our other tours, you’ll also get to explore all 8 levels of the underground silo — something most people will never see. From level 1 where you’ll view the silo closure door opening mechanism, to level 3 where the massive diesel generator is located, to level 8 more than 140 feet (approximately 43 meters) underground, you’ll see all the equipment that was necessary to keep the site operational during its lifetime. 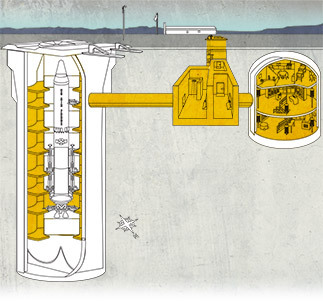 Other stops include silo level 7 where you’ll enter the launch duct and stand directly beneath the missile. Reservations and non-refundable prepayment are required. The tour runs from 8:00 AM to approximately 1:00 PM and is limited to 6 people. Reservations and pre-payment (non-refundable) are required.